During a June 21 press conference on the steps of Toms River High School South, Superintendent David Healy (at podium), Board President Ben Giovine (left) and district Business Administrator William Doering were joined by legislative leaders as they presented a unified voice in opposition of the state’s revised funding plan that was set to cost Toms River Regional Schools $3.3 million. October 17, thanks to tireless efforts on the part of district leaders, that funding was restored in full. This past June, the state announced a revised funding plan that would cost Toms River Regional Schools $3.3 million, despite the district’s 2017-2018 budget having already been approved. After months of tireless efforts from district, school board, and Legislative District 10 leaders, that loss in funding has been fully restored. The proposed funding plan first announced mid June was set to cost Toms River Regional Schools $3.3 million in state aid. This, despite the fact that the district is already operating at $31 million under adequacy by state evaluations, is among the lowest cost-per-pupil districts in the state, and has yet to recover $600 million in tax ratable losses from Superstorm Sandy in 2012. 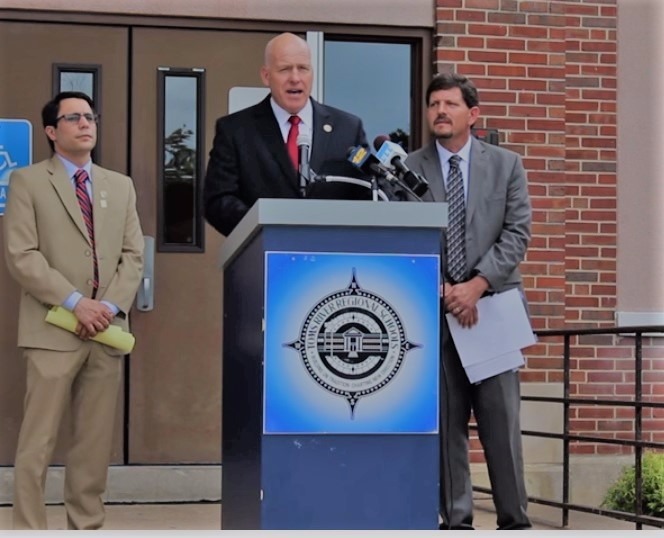 Superintendent Healy and Toms River Schools responded immediately by organizing a press conference on the steps of Toms River High School South June 21. Joined by the district’s Business Administrator William Doering, Giovine, Senator James Holzapfel, Assembly members David Wolfe and Greg McGuckin, and Brick Mayor John Ducey, Healy and his fellow leaders passionately outlined the unjust nature of the revised plan in front of members of the community and press. Toms River Schools enacted plans to rally in Trenton the following day to oppose the funding cuts, but were ultimately denied a permit to park its buses. Nevertheless, district leaders including Healy, Doering, and Giovine joined Assembly members Wolfe and McGuckin, Senator Jennifer Beck and others in Trenton that day, June 22, to meet with state representatives and voice their concerns. Those conversations continued throughout the ensuing weeks, and resulted in the state reducing the proposed cuts from $3.3 million to $1.4 million. Had the district been forced to absorb the $1.4 million cut, it made plans to do so without affecting staffing, but primarily through its fund balance, which would have brought that balance below 2% of its overall budget and placed the district in a deep revenue hole. Efforts, however, never relented, and the mantra within the district and among its supporters remained to advocate for its fair share of state aid. A series of meetings, visits to the statehouse, continuing formal correspondence, and lobbying on behalf of students and families ultimately convinced the state to restore its aid in full to Toms River Schools. “It’s difficult for me to overstate just how much time, effort, dedication, and resolve went into the process of restoring this funding for our taxpayers and, most important of all, our children,” said Healy. “I have to commend our Business Administrator, Mr. Doering, for his unparalleled expertise and countless hours in compiling volumes of support documentation, and of course Board of Education President Ben Giovine and the entire board for their backing and confidence in our leadership team.